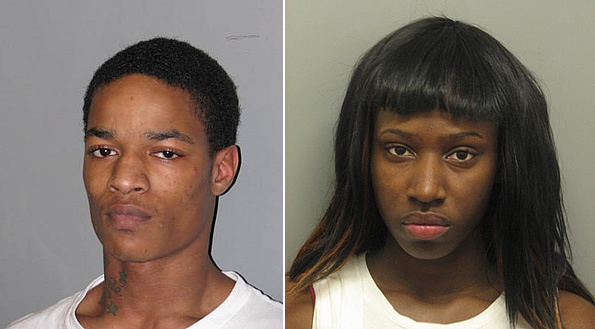 Deandre Minkens (left) and Shante Thomas (Cook County Sheriff Police photo). A Calumet City man and his girlfriend have been charged with the murder of an 18-year-old pregnant woman and her unborn child, Cook County Sheriff Thomas J. Dart announced Thursday. Deandre Minkens, 20, and Shante Thomas, 19, are each charged with one count of first degree murder and one count of intentional homicide of an unborn child, for their roles in the strangulation death of Rosemary Newman, 18, of Alsip. Minkens, of the 300 block of 156th Place in Calumet City, and Thomas, of the 2300 block of West Touhy in Chicago, will appear in Markham bond court on Friday morning. The investigation revealed that Minkens and Thomas spent several weeks developing a plan to murder the victim, who was nine months pregnant with Minkens’ child. Last Saturday night, Minkens invited Newman to dinner at a Crestwood restaurant while Thomas hid in the vehicle, waiting for them to come back. The couple returned to the car and as Minkens drove east, Thomas emerged and began strangling Newman. Both Minkens and Thomas then proceeded to beat the victim until she was unconscious. Minkens then drove to a Cook County Forest Preserve near Calumet City, where he strangled Newman to death and dumped her body in the woods. Between 7:30 and 8 a.m. Sunday, Newman’s body was discovered by a man walking his dog. Cook County Forest Preserve Police were notified and detectives with the Cook County Sheriff’s Office, with support from other officers with the South Suburban Major Crimes Task Force, launched their investigation. At the same time, Alsip Police notified investigators a missing persons report had been filed with their office just hours earlier for a missing teenage girl who matched the description of the body found in the woods. That report was filed by Newman’s family, who had reported her missing after she failed to return home. Sheriff’s Police detectives quickly identified Minkens and Thomas as persons of interest. During questioning, Minkens denied involvement in the murder. But Thomas ultimately provided investigators with a detailed account of the murder, which helped lead to the approval of charges by the Cook County State’s Attorney’s Office. Sheriff Dart thanked the Sheriff’s Police detectives who tirelessly worked this case, along with those officers assisting from the South Suburban Major Crimes Task Force, Cook County Forest Preserve and Calumet City police departments, along with other law enforcement agencies who assisted in this investigation.